This is the first game in the Strong Bad's Cool Game for Attractive People series. For other games in the series see the Strong Bad's Cool Game for Attractive People category. 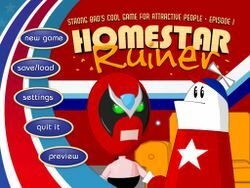 Strong Bad's Cool Game for Attractive People - Episode 1: Homestar Ruiner is the first in a series of episodic games based on the Homestar Runner internet cartoon series. It was released on August 11, 2008 for Windows and WiiWare. Strong Bad receives an email suggesting he "beat the snot out of" his long-time rival Homestar Runner. Strong Bad thinks this is a great idea, and heads off to look for him. When he gets there, however, he discovers Homestar has entered the Tri-annual Race to the End of the Race, and decides it would be even more fun to beat Homestar at his own game than to simply beat him up.